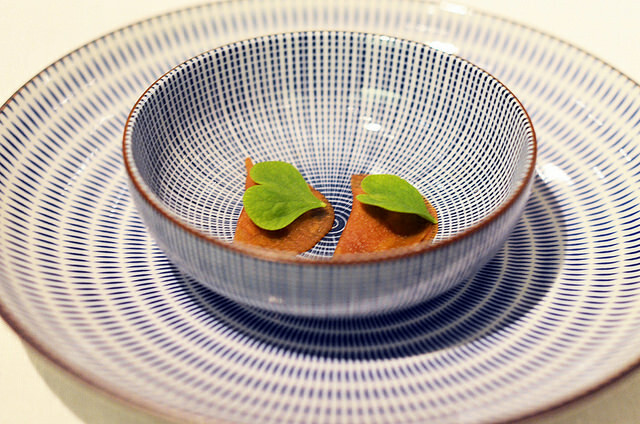 A visit to restaurant Tim Raue, currently ranked 54 on the WBPstars world’s 60 best, was one of our highlights of last year’s Berlin foodtrip. 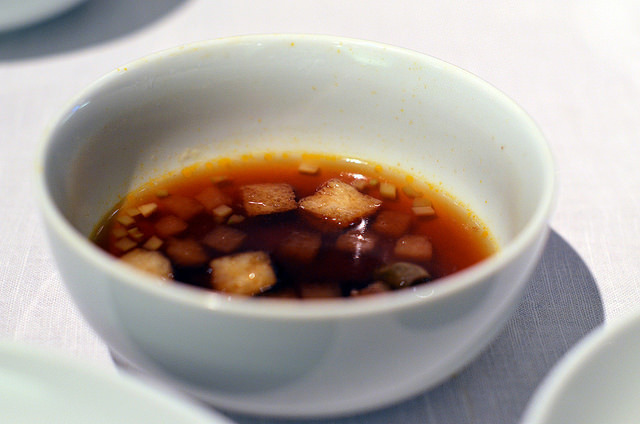 His typical refined cooking style with Asian touches is unique and makes the chef currently in high demand in Germany and abroad. 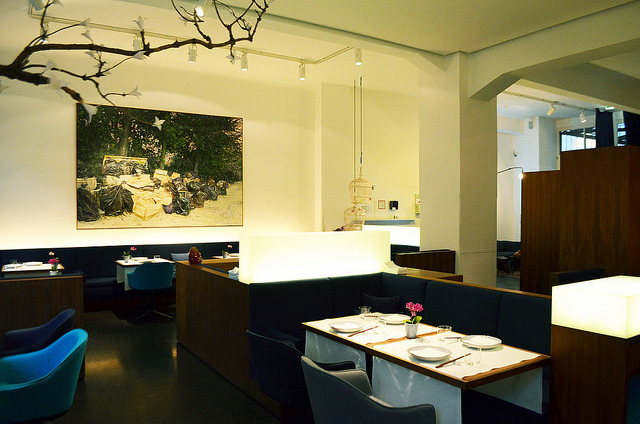 Restaurant Tim Raue is the gastronomic flagship of chef Tim Raue and located just around the corner of Checkpoint Charlie in the upscale part of Kreuzberg. The industrial building can be entered from a little inner court and the interior showcases exactly what Berlin has to offer today. Contemporary, art and joie de vivre are key words. The concrete floor and colourful artistic wall decorations enhance the right atmosphere. There is a big window towards the kitchen allowing guests to enjoy the spectacle. Believe me with Chef Tim Raue in the kitchen there is always some great show going on. 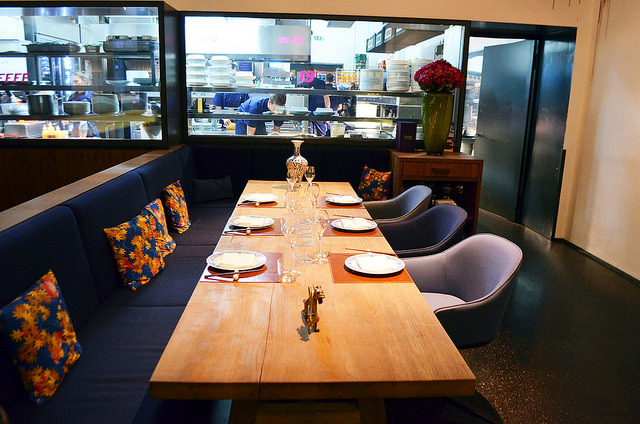 In front of the open kitchen you can reserve the Krug table with a special pairing menu. This big oak table seats up to twelve guests. Downstairs you can also reserve the private dining room, which is beautifully decorated, has part of the wine cellar and is illuminated by 300 bulbs. 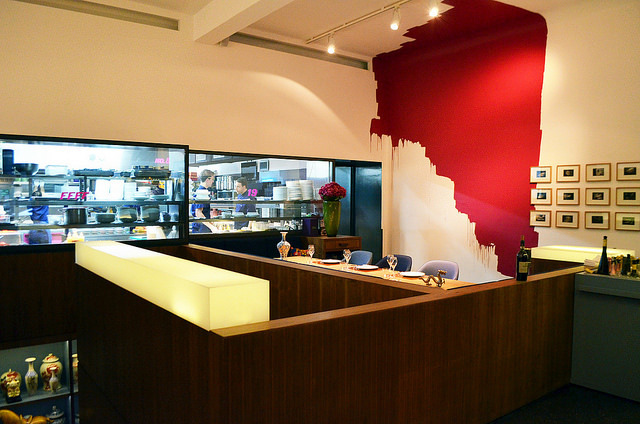 Tim Raue opened this restaurant in 2010 and also has two other Berlin restaurants. 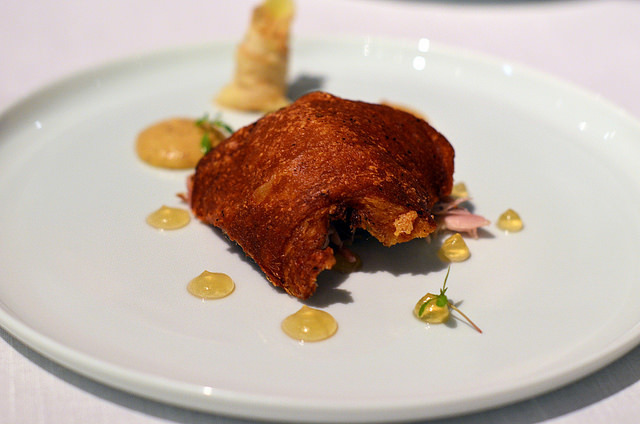 After being the head chef of Rosenbaum restaurant, the Swissotel Berlin and the prestigious Adlon Hotel he went on his own gastronomical trip to perfection. 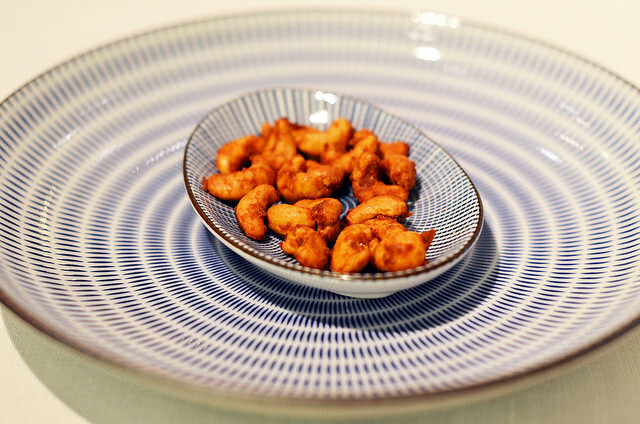 His flagship restaurant earned quickly a Michelin star and today he holds two stars and a Gault&Millau score of 19 on 20! 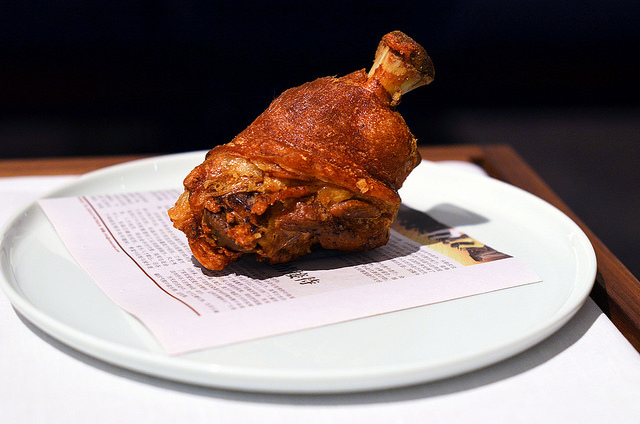 Chef Tim Raue is one of Berlin’s most famous chefs. Restaurant Tim Raue is not the only restaurant from the Berliner chef. 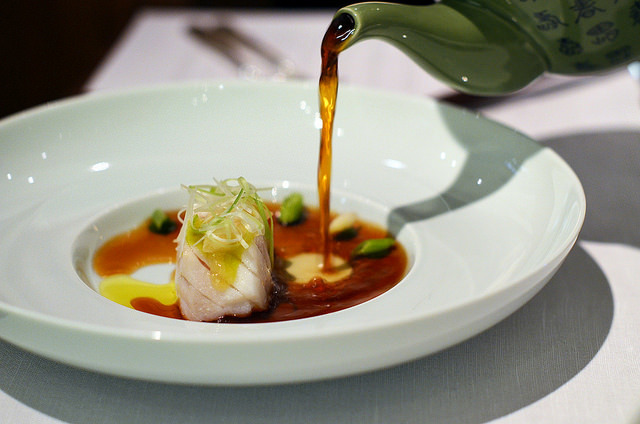 In 2013, he opened two other restaurants: restaurant ‘Sra Bua by Tim Raue’ in the Adlon Kempinski Hotel, where he serves a Japanese-Thai cuisine, and ‘La Soupe Populaire’, where guests discover German and Prussian dishes in artistic setting with changing art exhibitions. 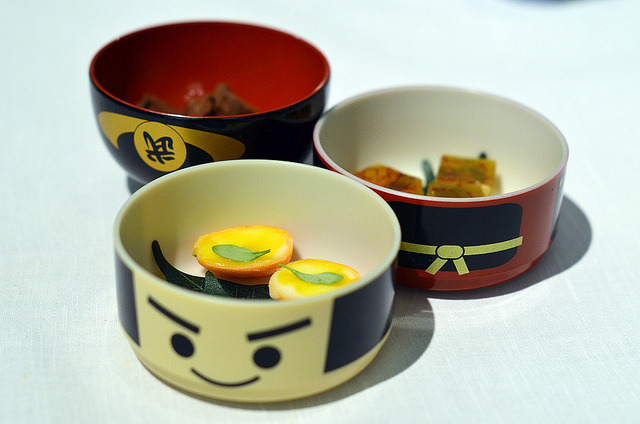 His cuisine is an assemblage of Chinese flavours, Thai aromas, European techniques and Japanese product philosophy. Tim Raue gets a lot of inspiration from his travels to Asia. 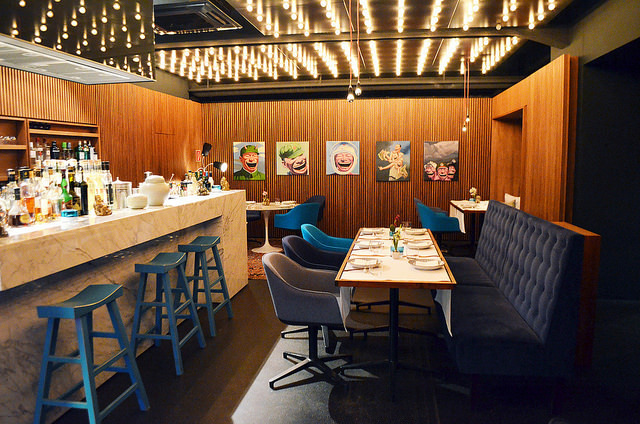 He believes in their ‘no-nonsense’ cuisine full of flavours and makes considerable use of their spices. 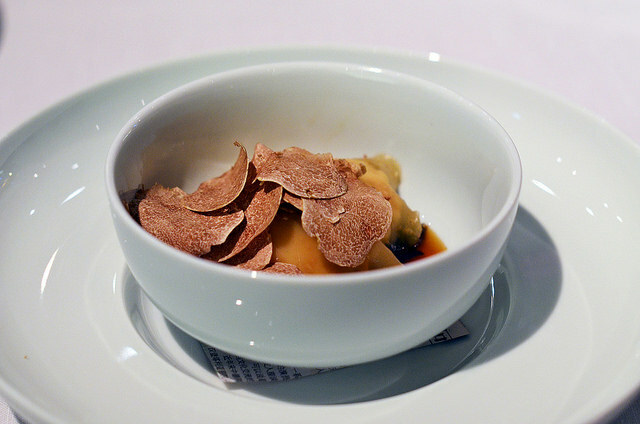 By adding luxury products such as caviar or truffle, he adds an extra dimension to the dishes, always respecting, and even enhancing, the Asian flavours. 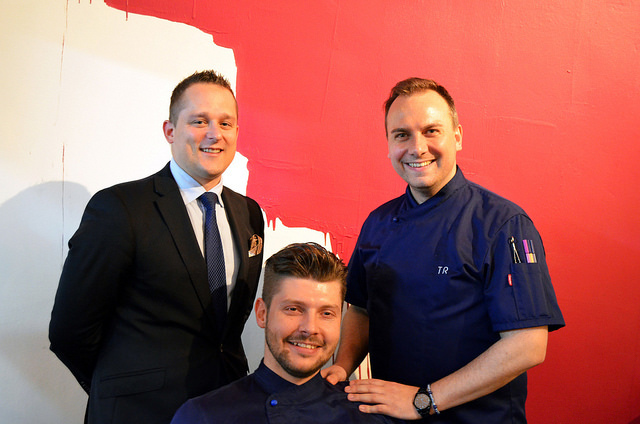 In the restaurant Tim is assisted by Head Chef Christian Singer and the talented sommelier André Macionga. His wine list offers 1200 varieties and reflects the love of exceptional wines. Beside the à la carte menu you can choose for one of the tasting or signature menu’s. 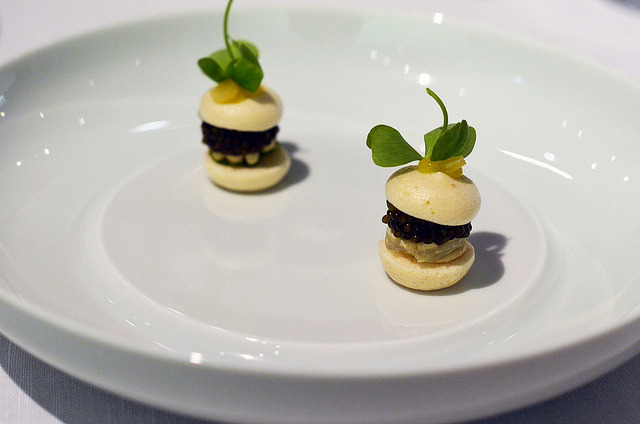 Vegetarian tasting menus are also being served. 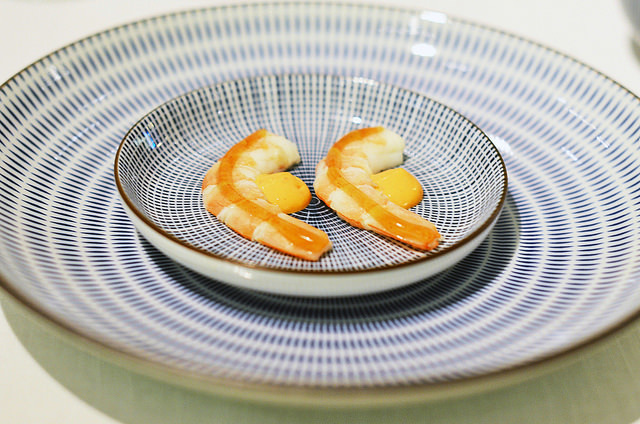 What makes all dishes and menus so special is the simple fact that the Chef perfectly knows how to turn traditional Asian products and flavours into high-end, contemporary gastronomy. Our Appetizers: a table full of little bites. Imperial caviar: a layered sprat meringue with butter cream, imperial caviar, sorrel, yuzu jelly, skin of yuzu, green chilli and lettuce. 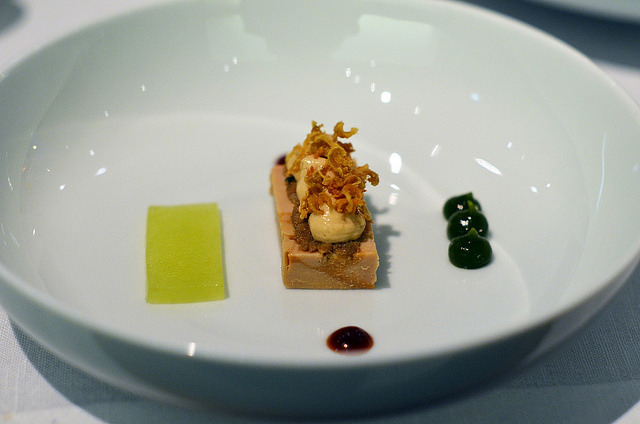 Goose liver: this signature dish is a goose liver terrine nicely flavored with matcha tea powder. 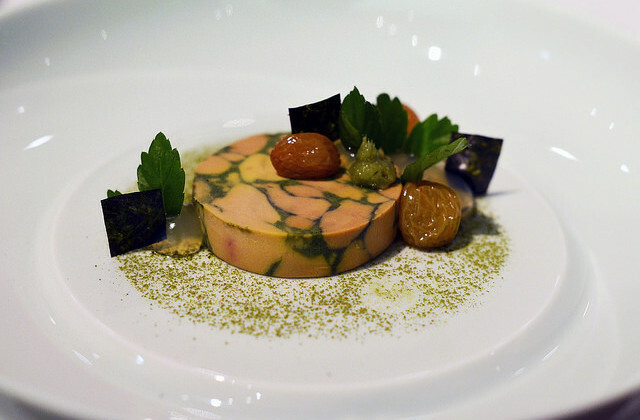 The terrine is combined with a jelly of white grapes, pickled and dried grapes, fresh wasabi paste, nori alga, jiaogulan cabbage and a wheat free nori alga toast. 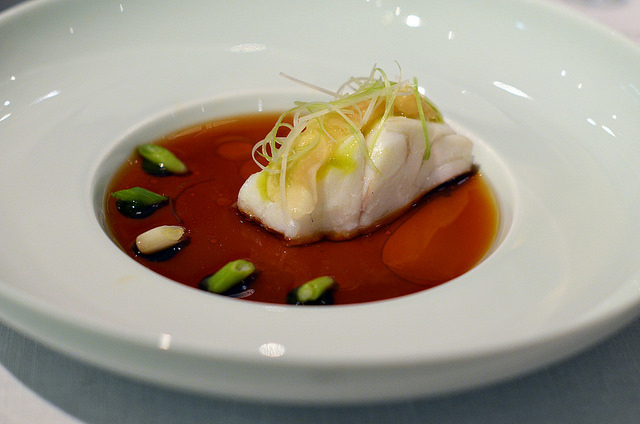 Pikeperch: steamed pikeperch butter, spring leek and young pickled ginger, stock of 10y aged Kamebishi soy sauce. 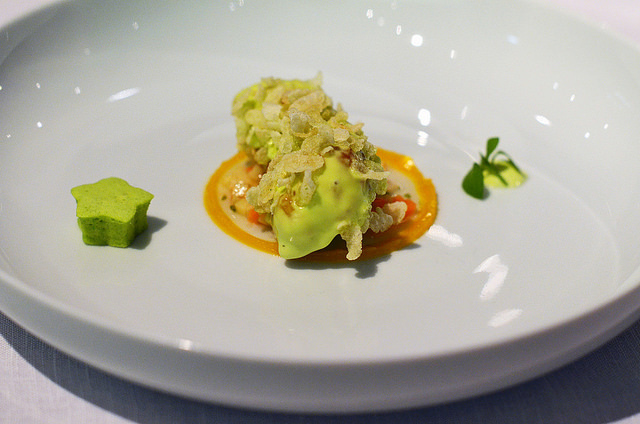 Wasabi Langoustine: a must when you visit Tim Raue. A big lightly battered langoustine is covered with a creamy wasabi sauce and green deep-fried Vietnamese rice. 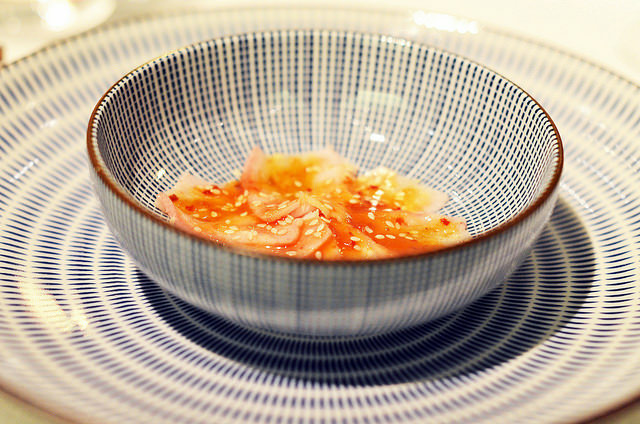 Full of intensity and crispiness the dish is served on a mango jelly, which has been filled with pickled carrots, mango and a stock of fish sauce. 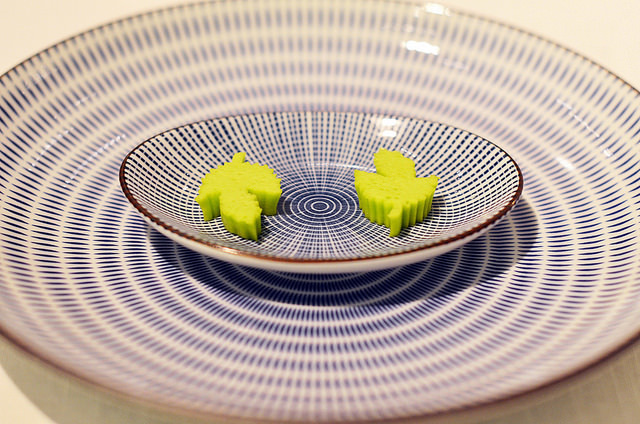 A finishing touch is given with the wasabi mayonnaise and marshmallow. Dim sum alba truffle: dim sum of piedmont hazelnut and rice dough, roasted ox marrow, Thai water spinach sautéed with Nuoc Mam fish sauce, sunchoke brown butter foam, stock of 8y aged rice wine and jus de truffle, dried grapes and Habanero chilli. Peking Duck: served in three times. 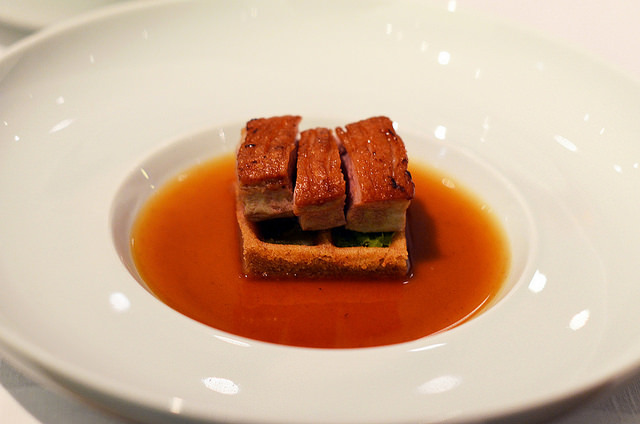 The crispy breast comes with a five-spice waffle, apple, leek and jus of duck feet. 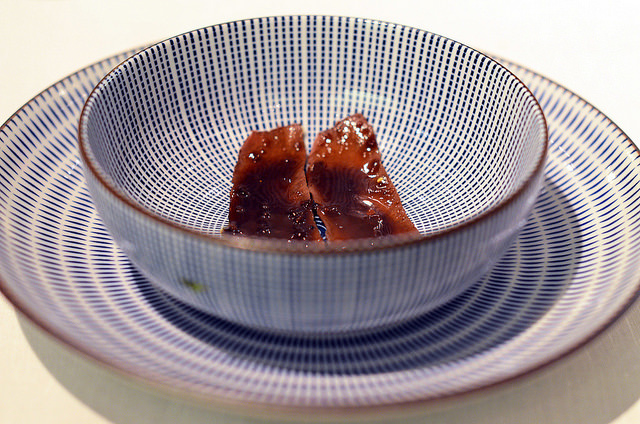 Peking Duck: the brew comes with tongue-heart-stomach, winter melon and bamboo mushroom. 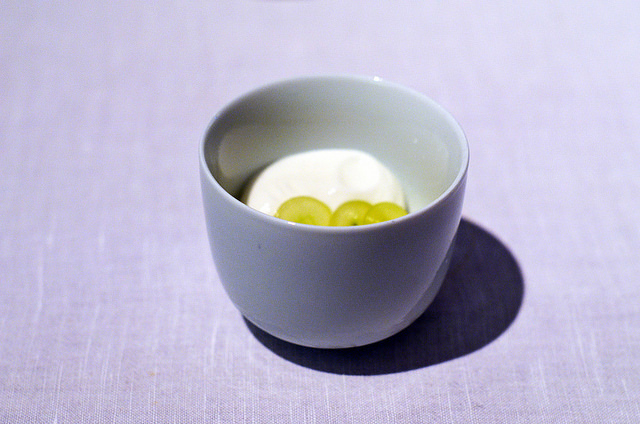 Peking Duck: the duck liver is served as a terrine with pickled cucumber and ginger-leek-cream. 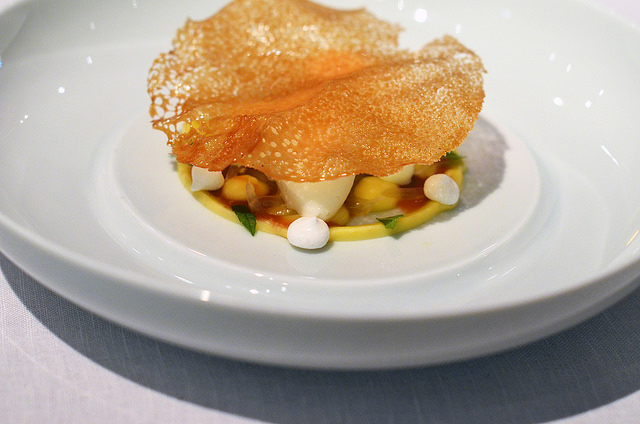 Yuzu: pudding and ice cream of yuzu, pickled pomelo, merengue of mace, caramel ‘beurre salé’ sauce and foam of crème fraîche and lemon verbena. 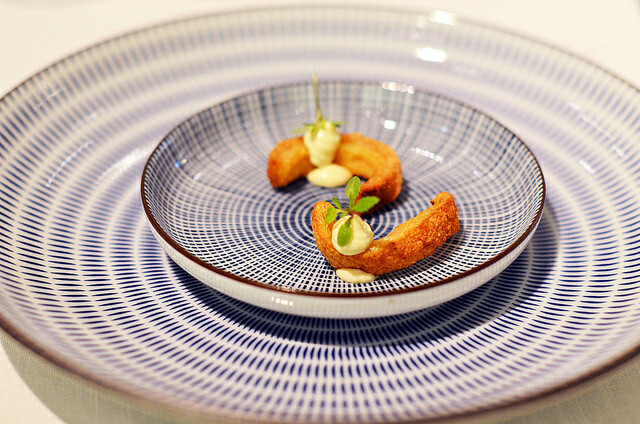 During our tasting menu the service was faultless and a special mention for André who serves very interesting wine pairings, which is not easy with this style of cuisine. Restaurant Tim Raue is unique and excels in innovation by combining strong Asian flavours with modern cooking. A truly unique experience! Last updated by begusto at 23/09/2016 .